The child provides all the nutrients and oxygen to the embryo and keeps both of you connected to the womb through six weeks of pregnancy until the baby is born. After your little baby is born, these ropes or nerves are no longer needed, because now your baby is able to breathe, eat and drain its own waste. Therefore, after birth, the navel rope is cut and - which does not have any painful feeling for your baby because there is no nervous system in this rope - a small remnant remains. The part that goes away is known as Navirjju, which you see attached to your baby navigand. Although it is not too complicated to care for this nave, even though it does not fall, there are a couple of things to be worried about parents, which we will describe here. According to Dr. David Perlstein of e-medicine health, your baby's nerves will usually be cleaned with a doctor's antiseptic within the first hours of the birth. After 24 hours of your baby's birth, the clamp is usually removed from the navel. Dr. Perlstein recommends that you take your baby out before leaving the hospital, requesting you to open the clamp, because it can obstruct the diaper change while going home and it may cause injury to the tissue. After cutting, what is the appearance of the remaining navel? Web MD expert said, after birth, your navel will appear a little sailier whiter and shiny, and may seem a bit wet. In the next few weeks (usually, about two to three), the navel will dry up gradually in the capsule, and instead of its color changes to brown first, gray or even black. The navel usually falls apart. Continue to the next page for important information about caring for your baby at home. Once the diapers were changed every time, the parents were asked to cleanse the nerves with alcohol, but now, doctors are advised against it and say that it will dry out quickly if you leave it alone. K. Woman and the Children's Hospital (KKH) assistant director Srimati Paulin Wai suggested to clean the navel of cotton with cold water in cold water. 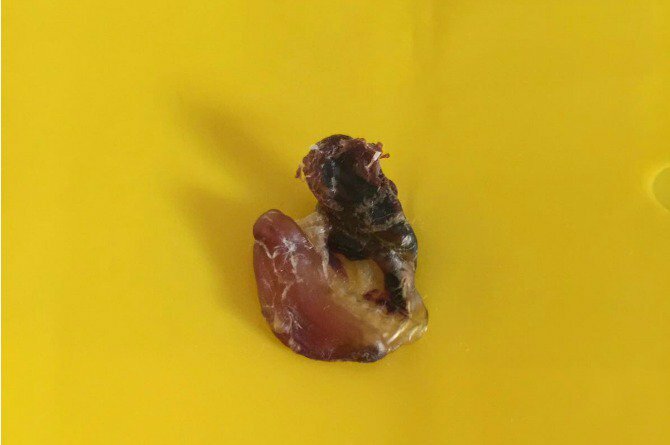 If the clamp is still fitted, then it is SMTi UEE's suggestion that you lift it slowly, "clean the rope from above and below", and keep in mind that there is a bad smell, bone or reddishness in the navel or side, which is the sign of infection. Keep in mind that if you see a dry skin near the navel or even a dried blood, it is completely normal. * The third page of this article can read more about the symptoms of navel infection. Pediatricians recommend that as much as possible to keep the navel in the open air, it will help to dry quickly, especially at the beginning. Avoid covering your baby's diaper with a diaper - to do this, you can fold the upper part of the diaphragm. In very hot weather, keep your little one on top of the diaphragm, which will increase air circulation, help to dry the navel. Also, change the wet or dirty diapers immediately to keep your child dry and prevent infection of the stumps . 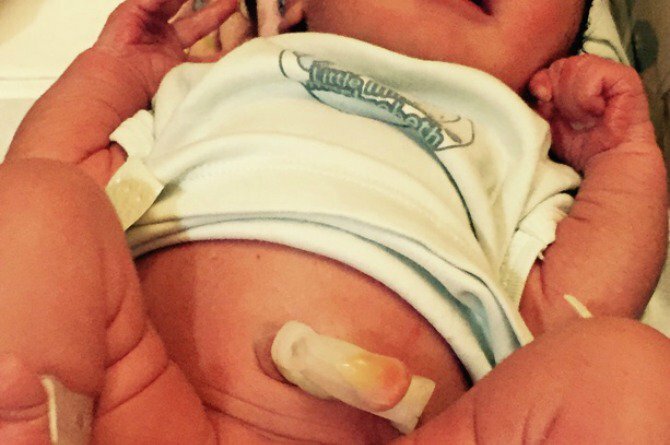 This is the best and most practical option to take care of your baby's navel. If the navel has dropped and where it was connected, then you can start your baby "proper" baby-tow bath after the space of the Navigand has completely dried up. You may be tempted to tear the nerves, especially when it hangs like a sutural. But experts have repeatedly warned against doing so to avoid the risk of infection. You should wait for yourself to fall off navel. Medical experts say that if the navel is already torn, then it may start to bleed actively, that is, every time you remove a drop of blood, the more bloodshed remains. Call your child's doctor immediately if you do this and continue bleeding in Navelkund. Naviraju usually falls into one or two weeks of birth. Where it was tangent, there is a natural, red spots on the skin beneath the navel. It is very normal to see. This is expected and soon it will come out of normal skin as expected and normal. Sometimes, very small amount of fluid fluid can come out here, for about two weeks, doctors say. It's pretty normal and you have nothing to worry about. What will you do after the fall of the navel? Hiding or dropping the navel depends entirely on you. But if you want to save it as a reminder, here are some great options. Sparkle Charm Spell - Kipsakes By And Wai Beautiful hand bone sparkle made of charm, starting from $ 109. "One of my friends said that it is good to keep the naveed red packet in the jewelry box and maintain happiness and wealth in the house. I absolutely agree to it "
Spell a "lulli stamp" : It is believed that your child's navel brings happiness and prosperity. Huexia Tawmby Center filled it with crystals, its price between $ 48 and Rs 468. Visit their website . Make an art - not only the navel, but the whole rope can make you art. Read this essay in Esien Parents article . Make memorabilia - Beyond the Willow tree is an Australian company that makes beautiful memorial objects with this navel rope. Visit their website. When will the doctor call? Get to know the next page. According to Doctor Bellevine and other experts, if you see any of the following symptoms, the doctor should definitely show. Any kind of fever (more than 100.4 degree) crisis for a newborn baby. If there is a fever, then immediately show the doctor. The doctor said Aparan, if the child's stomach and navel part is hot, or red, or is exposed to it, then take it to the hospital. This type of symptom refers to one of the most dangerous cases of epilepsy, in which nervium and infections in its four-part area. If navel red does not bend, but you see that a greenhouse emission from the navel means that your child's navel may be granulama. On the navel one will see a reddish tissue from which the emission is due. This condition is easily corrected, your doctor may ask him to put silver nitrate cream. Silver nitrate helps dry the reddish tissue and helps normal skin grow. After this treatment you can see emissions some dusk - there is nothing to worry about. This treatment is easy for a baby and it does not hurt. It is normal to have a little dry blood in the face of Navirjurj, but if the bleeding from the teaching is concerned then it is a matter of concern. Doctor Pearlsen said that it means that for some reason your child's blood is not high and should be shown with a doctor. According to WebMD, Naval Herner's symptoms are spreading around the baby's navel, especially after burning it. Most of the navel hernia itself is okay, but nevertheless it is better to show a doctor. 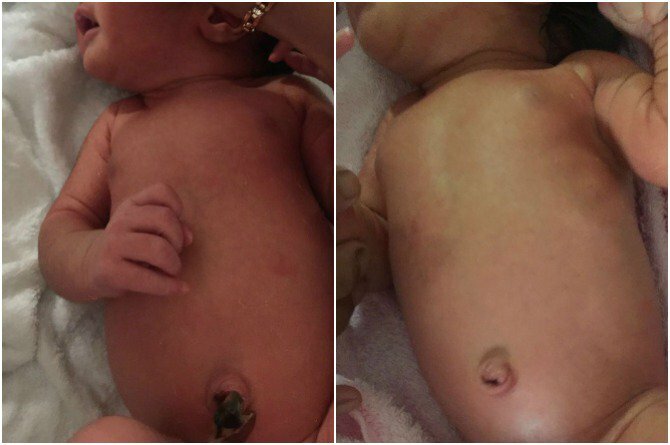 Your doctor should show that if your baby's navel is not lost after 4 weeks. According to Medesinopleus , it may be a symptom of a physical disorder or emmon system. Hope this article is informative for you. Share it with your friends.